Our Team always make sure what you want is the end product and you are happy with it. We specialize in providing metal building service and steel fabrication service. We can handle jobs as big as 260,000 square feet or as small as 100 square feet. 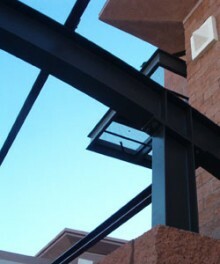 Structural Steel Fabrication Apache Junction, Arizona by Cave’s Canopies and Steel creates custom steel canopies, Ramada’s, steel carports, spiral stairs, carport repairs, fabric canopies, metal buildings, and architectural steel. If has to do with steel ask us first. Cave’s Canopies and Steel Inc., was started in 1999. From one man’s dream, his laundry room and his pencil to our fabrication facility on 3621 S. Meridian Rd. in Apache Junction, Arizona. All while treating our customers like they’re our only one! We continue to be successful and our customers continue to return with new business. To listen to our customers ideas and bring them to actualization. While staying flexible with design and cost.